Edible bulbs, a forager’s conundrum. Part of what I do in my leisure time is read scientific articles about the wild food plants that live here in North America. I know. Riveting, right? 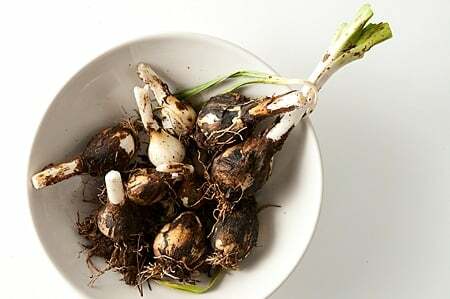 And in these articles the topic of edible wild bulbs, corms and tubers comes up repeatedly. They are nutrient dense and can be as good or better than onions, our most commonly eaten bulb. Many Native American groups used some sort of wild bulb as a matter of course, and a few groups relied on them as a main staple — notably the Western tribes who relied on the bulbs of the blue camas or the sego lily. What you are looking at above is a bowl of the bulbs from Camassia quamash, or blue camas. It, and its Eastern cousin the wild hyacinth, have been eaten by Native American groups from British Columbia to Georgia for millennia. But few people eat these bulbs anymore. And it is not only because the knowledge of them has been lost. To eat a bulb is to kill the plant. So even following the forager’s code — take no more than a quarter of any stand of plants — will still greatly reduce a patch of bulb plants. This is a problem with ramps back East, which in some places are being overharvested. For my part, I know of many edible bulbs here in California I’ve never taken because I’ve never seen them in stands thick enough to justify picking. After two years of looking, several weeks ago I finally found a stand of Ithuriel’s Spear, Triteleia laxa, worthy of harvesting. But even then I hesitated. I could stare at this flower for hours. But by all accounts, it is delicious roasted. 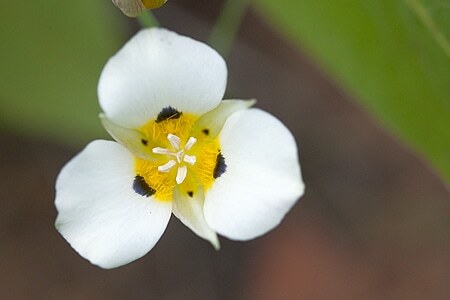 Its cousin, the sego lily, is the state flower of Utah in no small part because the early Mormon settlers survived off these bulbs when their crops failed. I have never seen large stands of this plant, and so haven’t had the urge to harvest them. Ditto with the edible white brodiaea, Triteleia hyacinthina, which grows abundantly around Truckee in the High Sierra. They look tasty, right? Well, I read in some guidebooks that, eaten raw, they were crunchy and sweet. So I ate one. Ew. It was gummy, stuck to my teeth, and was not very sweet at all. This is a problem with many guidebooks, which blindly pass on misinformation printed in earlier guidebooks. It is a real dilemma for a beginner, who is left at a loss about who to trust. They are nice boiled, but they are a lot of work for such a small bulb. All of this brings us to the Queen of Bulbs here in the West, the blue camas. I love those flower stalks that look like a set of firecrackers exploding in slow motion. Blue camas is, obviously, on the left. Her distant cousin, Zigadenus venenosus, is on the right. Common name: Death camas. Inviting, eh? 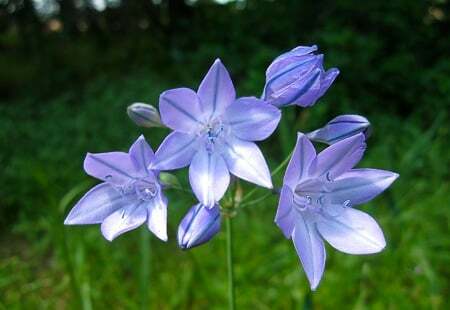 This is probably the chief reason few people gather blue camas these days. Unlike the other edible members of the lily clan, camas does still grow in vast numbers throughout the Mountain West. Even though the “camas prairies” are greatly reduced from what they were when Lewis and Clark first dined on baked camas bulbs (you can thank agriculture for that), there are still plenty enough to harvest a few meals each year. 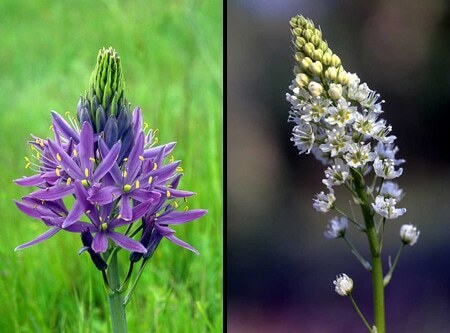 But you need to watch out for death camas, which can grow right next to Lady Blue in mountain meadows. Most foragers advise that you harvest when the flowers are in bloom, so you can’t make a mistake. But as anyone who’s eaten a carrot that’s gone to seed knows, eating a bulb when it is flowering is not ideal, culinarily speaking. You really want a bulb when the plant is storing energy in that bulb, not spending energy flowering; it will be fatter and tastier. So a good compromise is to harvest right after flowering, when the seed pods are ripening. 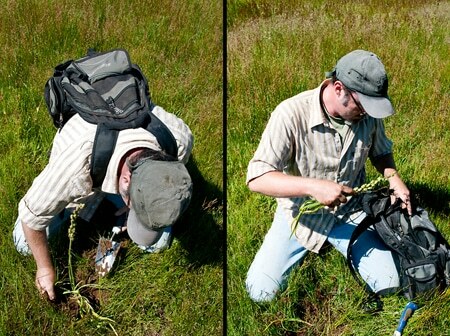 Here’s how to identify blue camas after the flowers are gone. First, look at the seed heads. 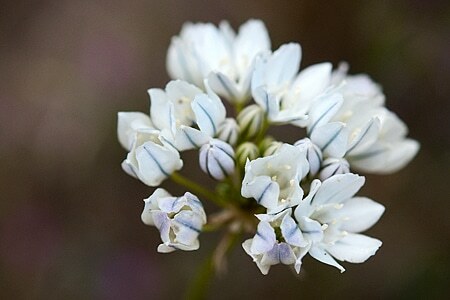 The pods of blue camas will be roughly 1/4 inch across and a 1/2 inch long, or larger, and a blue camas will set seeds farther along the stalk than a death camas will. 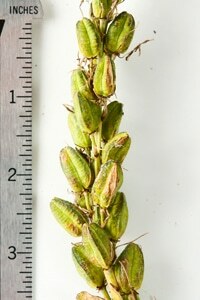 Death camas seed pods are usually 1/8 inch or smaller and the pods will all be bunched up at the top of the stalk. Incidentally, if you let the stalks dry you can plant the seeds in your yard in fall. They need some chill time, so if, like me, you live in a warm winter zone, you will need to stick them in the fridge for a couple months before they will germinate. Blue camas will, in general, be a larger plant than death camas. The exception to this is if you happen to be in a dappled shade environment or at the edge of a forest. There the camas will be stunted, and will approximate the size of a death camas. I’d recommend skipping those sites. Digging camas bulbs isn’t the easiest thing I’ve ever done. The bulbs are usually about 4-7 inches below the soil surface, and where Holly, Chef Jacob Burton and I dug them last weekend near Truckee, the soil was full of clay; it broke Jacob’s trowel. I did manage to gather a dozen before giving up. Dig only in large patches of them. Patches are often separated by a few yards, so look around in a meadow before digging. You don’t want to dig where camas is just barely holding on. You want to dig where it is thriving. Harvest only a few bulbs from each patch. Stick and move. Gather no more than a fourth of each patch before moving to another one — and preferably fewer than that. I was digging about 2 bulbs per little stand of 15-20 plants, then moving on. Go for the biggest plants. They will have the biggest bulbs. Leave the stalk on the bulb for now. 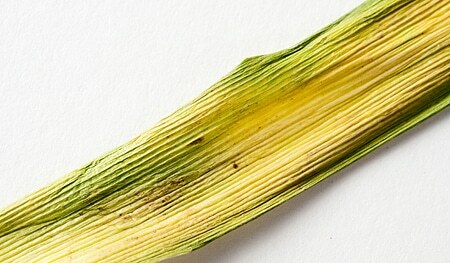 It will help you double check that it’s blue camas before eating them. You can skip this if you are gathering camas when it is in flower. Clean the bulbs when you get home and stick them in the fridge. 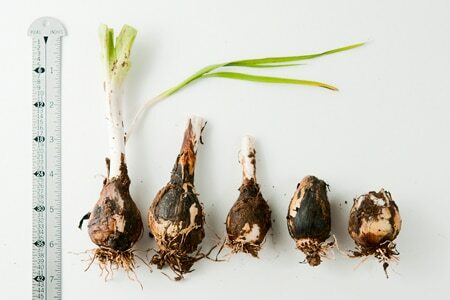 Camas bulbs spoil fast at room temperature. Is all of this worth it? The digging, the risk of misidentifying blue camas with its poisonous look-alike, the careful harvesting — and the risk of catching Cain from people who think digging wildflowers is not much better than clubbing baby seals? That’s your choice. I happen to like camas a lot. But even I will only harvest enough for a meal or two, and even then not every year. 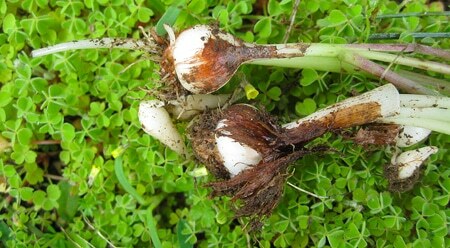 (Read this article if you are interested in how to cook camas bulbs.) If you do choose to harvest edible bulbs, do it responsibly.